Remove OSPF filtering applied in the previous lab. Configure R4 such that it learns prefixes advertised by R5 via OSPF (Lo0: 10.0.5.5/32), but R5 does not learn any OSPF prefixes from R4. OSPF state between R4 and R5 should be 'full'. 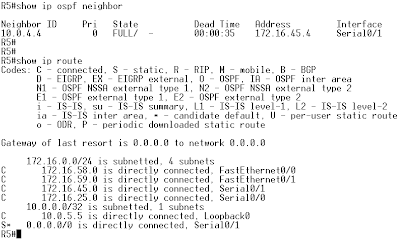 R5 should use a static default route in order to get connectivity to the rest of OSPF domain. Do not use any filtering mechanism to accomplish that (such as ACL, route-map etc.). Can you enumerate OSPF intra-area and inter-area filtering mechanisms? Apart from reducing the size of the routing table, what other goal can you accomplish with prefix filtering? What are two ways of using LSA Flood Filtering? Pic. 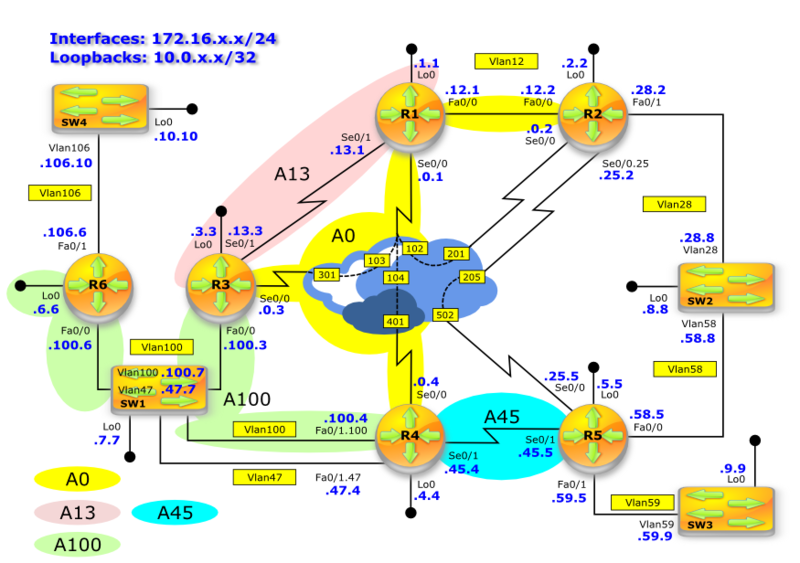 2 - R5's OSPF Routing Table Before Filtering. 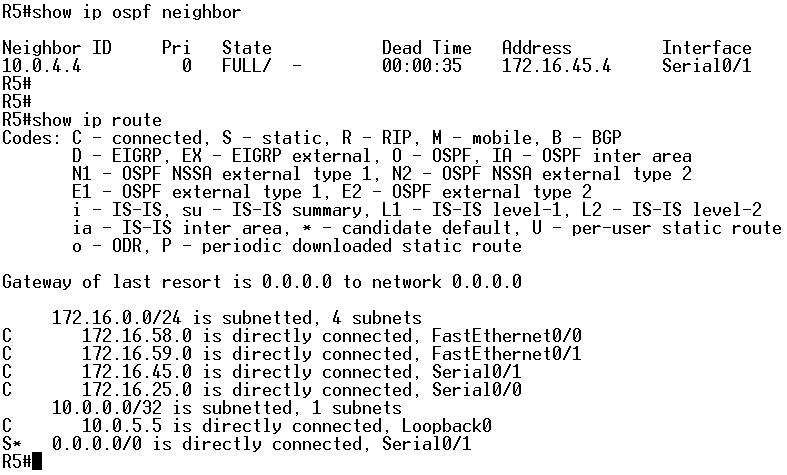 Clear IP OSPF process on R5 for this change to take effect! Pic. 3 - R5 After Applying Solution. Filtering in OSPF can be applied as INTRA-AREA and INTER-AREA filtering mechanism. INTRA-AREA filtering cannot filter LSAs but can filter prefixes sent from LSDB into a routing table. distribute-list (with ACL, or route-map referring to ACL or prefix-list). Changing Administrative Distance to 255 (Unknown) on chosen prefixes. area number range pfx not-advertise. area number prefix-list name in|out. We must not forget that LSA and/or prefix filtering can help us influence the path selection (traffic engineering).